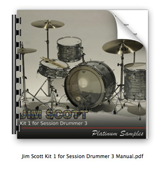 High resolution drum kit for Session Drummer 3 with up to 19 velocity levels and 4 round robin variations. 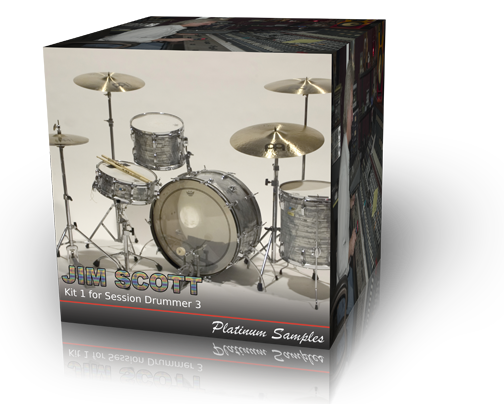 Kit 1 is one of Jim's own personal Ludwig drum kits and was recorded at Jim's own PLYRZ Studios through his Neve 8048 console. Formatted for Cakewalk Session Drummer 3 and Dimension Pro in unprecedented detail with up to 19 velocity levels and 4 round robin samples per level. Ludwig Sky Blue Pearl 5x14"
Ludwig Sky Blue Pearl 9x13"
Ludwig Sky Blue Pearl 9x14"
Ludwig Sky Blue Pearl 16x16"
Meinel Byzance Thin Crash 19"
Meinel Byzance Medium Crash 20"
Ride: Meinel Byzance Ping Ride 22"
Hihat: Meinel Byzance Dry Hats 14"